Khloe Kardashian and Lamar Odom have recently been accused of a charity scam. The charity scam has been flooding the news outlets. 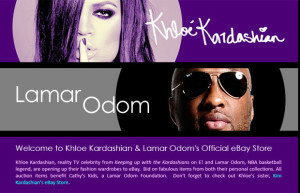 Khloe’s name seems to have just been thrown in the mix, but mainly the charity was started by Lamar in 2004 after the death of his mother to stomach cancer. Apparently some news sources are saying that not all of the funds are accounted for and that Lamar’s charity has paid out some of the charity money but it wasn’t as much as expected. The fund raised $2.2 million of which reports state that the charity used $1.3 million to finance two unidentified elite youth basketball travel teams and paid an annual salary of $72,000 to executives of the charity and Odom’s best man, Jerry DeGregorio.This is even after the foundation shows a debt of $256,000 on their tax return, according to an investigation conducted by ESPN, claims the Gazette. It could very well be that the whole thing is being blown out of proportion. I would have to imaging that Lamar wouldn’t be taking advantage and creating a scam out of something he started after his mother’s death. This is a charity that was sentimental to him, so I’m thinking he just hasn’t had the time to tend to it. I guess we’ll find out what the deal is with the Lamar charity soon because it’s all over the news and I’m sure he’s trying to get to the bottom of this. Wow that wasn’t a good thing for Lamar to say!